This is an e-mail I had from one guy last week. Outside of the “will my girlfriend notice?” type of question, this is a variation of an issue that I have heard so often now that I think it’s worth devoting a specific piece to. Getting taller AT WORK. The concern about work colleagues (and specifically new ones) applies to guys of all heights – another guy who has now bought a couple of pairs of GuidoMaggi elevators – you know who you are! – wrote to me a year ago bothered that he too had always been the tallest and that a new guy was about to start (in a few weeks) who was taller. “I urgently need to do something”. Most of you will laugh – this guy who wrote to me a year ago is … 6’4”, his new rival 6’6”! Mike (the latest one, above) is just a tad over 6’. But I have also had many similar questions from guys of ALL heights and the rules are similar. So it emphatically is NOT just a situation that affects guys who are 5’6” and want to get there with the 5’10”s. It cuts right across all guys because of the macho nature of size and height, and the perception that taller people are somehow advantaged. The issues around adding height in this situation, though, are quite different to those involved in wanting to add height socially in a club or out at night in the bar. Work is of course massively varied, with ever changing and evolving dress codes. Some types of business are very demanding with the dress code, even casual being defined right down to the colours and widths of trousers and styles of shoes – the guy who wrote to me at the top of this piece (and in fact also that very tall one a year ago I additionally referred to) work in offices where pretty formal wear is the order of the day. Suits, ties, jackets, colours and styles that have remained pretty much the same (but with subtle changes to allow for trends that pass into the mainstream) over the past 20 years or more. 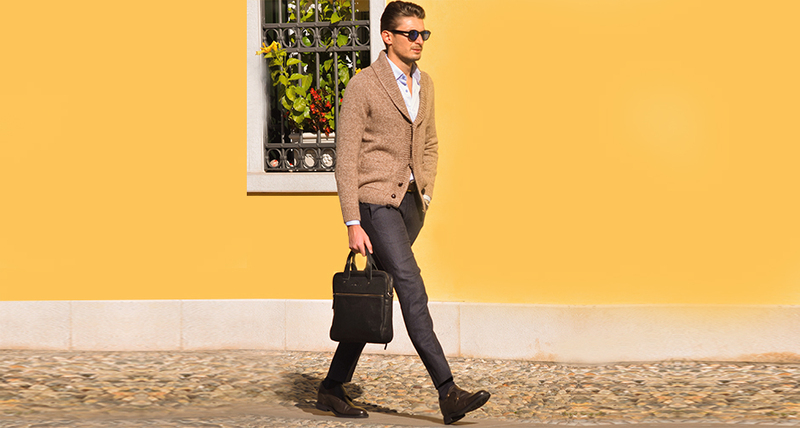 The first important point is that there is probably almost no room at all for big boot styles – but YES to the flatter kind of boot styles that double up as shoes that are often worn by younger guys with suits and formal work trousers in an office situation. This is good news: they can add more height and they really are NOT just for the young – they can be worn by all. Similarly there is a little latitude in many places for a bit of fashion – and it is within fashion trends that you can often get away with a bit more. Here was my plan for Mike to get taller in a way that is not noticed and also does not break the standard office code on what you wear. Firstly there is a limit in most offices on the added height you will ever achieve simply by virtue of the fact that thicker-soled boots are a big no no – just look at the red carpet guys who wear suits and great chunky boots to appear taller (sorry Vin Diesel and RDJ, but they look all wrong) and you can see why they just do not fit the formal ethos of most offices. I stress that this does not apply to all offices – again I talk about your average office of professionals outside of the creative. The start point for Mike (after trying out an inch or so of lift every day in is current footwear) is really twofold – ‘dress shoes’ like the range here all of which come in up to just over 3” (8cm) and boots like the Milano, Gallipoli, Roma, Prague or (my fave and the ones I wear all the time) Ischia – I don’t work in an office, never have but these boots fit ALL moods – and these can come in up to 4” (10cm). But not 5”. They have a flat enough sole for almost all workplaces (that is a real key) and they fit the most recent ideal of the kind of boot that is worn with the suit. A lot of young guys began wearing boots with suits because they give a better line than many shoes, the suit hangs clean over them in a line where with shoes that’s more difficult to finesse. As I always say, ALL shoes add about an inch, then bear that in mind when you buy – in Mike’s position as he is well over 6’ already, I would go for a 3” classic shoe and a 4” boot if he thinks he needs to have both kinda styles – but if boots always do the trick, then no problem, go straight for two varied pairs of 4” boots – flat sole, not the chunkier sole you get on the 5” boots. And with the two pairs of removable lifts that come with the boots (one slightly higher than the other), you can go slightly up and down in height according to what you want – you will quickly find that you can go a bit higher after wearing them for a while. It is about confidence – I can tell you several times that ‘no-one will notice’ but you really have to learn for yourself. I have said it here before about people’s lack of ability to spot changes or things about appearance. Doing stuff out of work with colleagues? But there are important caveats for work, based on the variations of your own experience. No workplace is just ‘go to work, sit at desk, make the calls and leave’. Interaction, banter, movement, socializing – all sorts of stuff mean that there are major differences. For example, if you play a sport with your colleagues after work, then it will be more difficult to carry off a 4” elevator, specially if you are shorter. Not impossible but difficult. You have to wear less addition in those circumstances – don’t worry about the very odd occasions when taking shoes off, those can be finessed (eg at airport security with a colleague, I have written about this in my column already). But regular occurrences through socializing etc require you to drop at least an inch for day-to-day, with a bit higher for special. And my same rules about height addition depending upon your current height also apply. Scroll up and you see I did a piece about these – read this, as the same rules apply here. For example, I would be uneasy advising a guy who is 5’6” to add 4” day-to-day. Sure, for special occasions and when you want to appear specially tall. And SOME guys DO do this anyway with no issues– but day to day, for me, your best bets at that height are the 2” and 3” boots to start And then if you think you have no issues or problems, then go for the 4” boots. Once again, it is counter-intuitive I know, but no-one at work will notice these fine distinctions, these grades of gradual increase, really they will not. Gradual change on the old ‘boiling frog’ principle works its magic every time, specially with adding height. In work more than anywhere. And walking taller at work feels very cool.